‘Bohemian Rhapsody’ was crowned with Best Sound Editing one week ago during the last installment of the Academy Awards. Regardless of whether that was real life or just fantasy, the truth is the film took home several Oscars figurines, including Best Sound Mixing as well. When it comes to the film itself, actor Rami Malek delivered a really compelling performance as Queen frontman Freddie Mercury, especially when the character was singing —and that’s because the singing, for the most part, was actually “performed” by the real Freddie Mercury. Additional singing, especially for the non-live concert scenes, was performed by singer Marc Martel. Those two voices together were responsible for Malek’s convincing portrayal of Mercury. Putting them together and then making them come out of Malek’s mouth required more than simply a well-carried out editing process. According to editor Nina Hartstone, the editing for only the singing parts almost took open heart surgery-style editing. 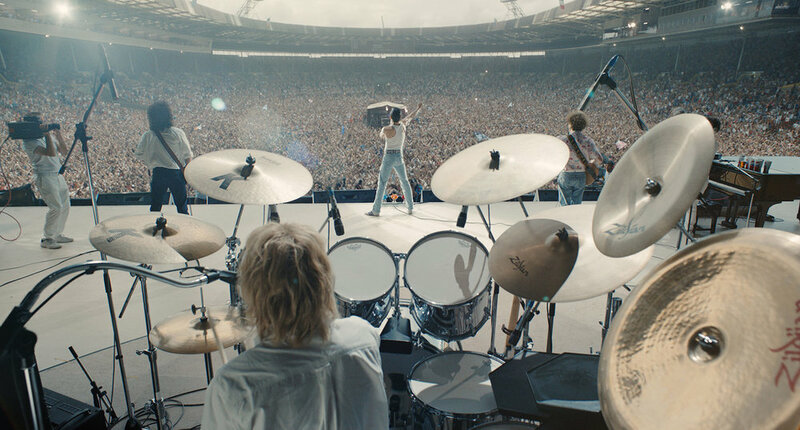 In order for the production to recreate the concerts in the film, supervising sound and music editor, John Warhurst, had to do the unimaginable to capture Queen crowds stomping and clapping in unison for the iconic ‘We Will Rock You” whilst singing along with the band’s Live Aid famous set, which is essentially the cornerstone of the storytelling in the film. The duo, Hartstone, and Warhurst, recently discussed in an interview how they were able to craft the incredible and massive Live Aid set, and the lengths they had to go in order to recreate the recording session at the Rockfield Farm. They also talked about capturing the vast majority of custom sounds, like the ones we hear during live presentations, concert crowds, and extra material. When asked about whether or not Malek participated in the singing parts, Warhurst stated clearly that the vast majority of the singing is, of course, Freddie Mercury, as it seemed right to use his own voice to keep his spirit in the film. He also said that, when production was first putting together the script, ever change also demanded a change in the vocals, which ultimately forced the sound editing crew to come up with ideas on how they could edit them. Every time they had a version of Freddie Mercury in a multi-track format (with the vocals in separate tracks) Warhurst and Hartstone would use them. During the filming process, Harstone asserted, in order for them to get it to look like Malek was actually performing the songs like Freddie Mercury does, the sound editing crew had to tell the actor that he would need to sing the material on set with loads of energy. Malek was responsible for giving more than he was capable of when it came to singing, which would have been fine if they had invested the same amount of time the band did during the Live Aid set (20 minutes); however, that particular scene demanded production and the sound editing crew a staggering two weeks to get it right. Malek had to sing at the top of his singing capabilities for almost fifteen days, take after take. From the Live Aid takes, the sound editing crew got a lot of Malek’s breaths and his movement sound. Those were put together with Mercury’s vocals and combined the two, which, in the end, yielded Nina Hartstone an Oscars nomination and the prize, as she was solely responsible for that. Harstone said several times that she wanted to achieve the highest degree of realism. Aside from wanting it to look that Malek was actually singing, Hartstone went on to use a lot of the actor’s breaths whilst he was performing on set and also from subsequent material the duo did with him in between takes. Breaths, efforts, lip sounds, and other tiny sounds were combined with both Martel and Mercury’s vocals, tying them into the final picture, finally making it look like it was actually Malek singing. Such efforts and display of resources allowed the movie to stand out amongst the other films in this category. Throughout the film, there are plenty of scenes, aside from the Live Aid, that also required the best of Malek, Warhurst, and Hartstone. For those scenes where there simply aren’t a recording of Freddie Mercury, like when he’s singing Happy Birthday or Love Of My Life, the sound editing crew had to surgically mix three different voices: Mercury, Martel, and Malek. In order for them to mix the voices, the duo described this process as open heart-style editing. Both Hartstone and Warhurst had to go deep into the waveforms to get the transitions to work, paying special attention to detail. As for the tools used, it’s been said that iZotope RX played a vital role helping them get the EQs to match; however, even before using software and bringing other tools into it, the sound editing crew had to get the whole editing to feel right.